With VVols, you don’t really failover a single VM, you fail over a replication group. While it is certainly possible to just recover a single VM from that failover etc, I will, for this blog post, show failing over the entire group. My PowerCLI version is 11.1.0. Make sure you are at least running this release–there are important updates that make this process simpler. Older revisions require a few more steps. Register VASA from both arrays in their correct locations. More on that in the next section. The next step is to run the test failover with the command start-spbmreplicationtestfailover. So go ahead and run it. I highly recommend storing the response in an object–the operation will return the VM paths to you, so you can then register and power them on. The target FlashArray does a “purepgroup copy” operation. This takes a certain pgroup snapshot (which is a consistent snapshot of all of the volumes in that pgroup at that time) and creates a new local pgroup with all of the new volumes created from that pgroup copy. The new pgroup is enabled to replicate back to the original FlashArray, this will be cleaned up during the test failover stop. This is created to allow for some advanced post-test operations. It then creates new volume groups, one for each VM created in the test and adds their corresponding volumes to it. Then associates the new VMs to the target VVol datastore. The last step is from VMware. Updating the files in the VVol datastore. This takes the bulk of the time. This will register all of your VMs. You will likely want to change the “new-vm” line to register as appropriate to your environment (what cluster or host, or resource pool, or folder etc. Now make any changes if necessary to your VMs. Change the networking etc. Go ahead and power them on! Once you are done, go ahead and power-off the VMs and unregister them. You can either just unregister them, or you can delete them from disk. It doesn’t really matter–though my recommendation is to just delete them. The last step is then stop the test failover–this allows the array to clean itself up. This will clean up any remnants of the test failover (volumes, volume groups, protection groups) on the array. 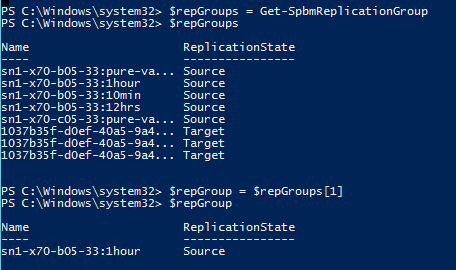 Sometimes you will get failures when using the get-spbmreplicationpair. This usually means a few things. First you didn’t specify the source replication group. This means it will query for everything. Basically means you ran get-spbmreplicationpair without any parameters. Or/also, you are not connected to all of your required vCenters. 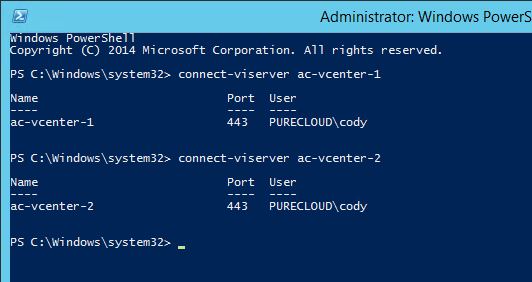 PowerCLI queries all available VASA providers from all vCenters and then matches the appropriate pairs. If one half a relationship is not reported by anyone, PowerCLI will report an error for that pair. If you didnt connect to a vCenter that exclusively owns your target VASA provider, you will see some failures. Or maybe you don’t care about some of the pairs, which means those errors don’t matter. The pairs you need are returned, but it will still report errors for the others, so to keep things clean, be specific with your queries. Include the source group in the get-spbmreplicationpair cmdlet. the vSphere server for peer replication group is connected. Above I did a query for all replication pairs. In my environment, I have two arrays. Both of which have a protection group that does not have replication enabled–this means there is no target group anywhere. So for those an error will always be returned in this cmdlet. This is why it is good to be specific in this particular query. ‘/VIServer=purecloud\cody@ac-vcenter-2:443/’: Unknown server error. See the event log for details. In this case, ensure the VVol datastore is properly mounted where you plan to recover. I try to simulate a VVOL environment and follow your script. But always got some error when I use “Get-SpbmReplicationGroup”. Of course, I can’t run test failover, still can’t get $testvms. I am not sure what I lost…..
Error 1: Replication group not found. 警告: 參數 ‘SourceVvolIdMap’ 已過時。This parameter is no longer required and will be removed in future release. ‘/VIServer=vsphere.local\administrator@172.16.115.2:443/’: A replication fault was reported by the VASA provider ‘FA-405-ct0’. Thanks, I already open a ticket  for that. How can we we perform a “failover” in the event of a full disaster where the source datacenter is gone (including the source pure array w/ the vvols and the source vcenter appliance) using the replicated volumes on the target pure array? I assume the Start-SpbmReplicationFailover method will not work in that case as the source vcenter is not reachable and we would have to construct volume groups and then some how add them to the target vvol ‘datastore’. Is there a sample of that in powercli somewhere or can you provide some pointers? Guessing we would have to save/cache some of the data from the original datacenter (vvol uuids + ?) and then use the APIs? Thanks for another good VVol post Cody! I don’t use Pure, sorry about that, but I seem to get stuck with FailedOver replication groups which don’t want to clean up. Do you have any idea why maybe? 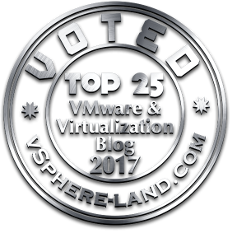 The VM has been unregistered from vCenter. Error 1: Replication fault has occured. You’re welcome! Have you looked at the vmware-sps log in vCenter? That will likely give you better insight into the issue. Unfortunately there is a lot of vendor specific behavior behind some of these commands it is hard to say. The VASA provider might have delivered a better error to the vmware-sps log though. It is possible that if the VMs are still running or connected that test failover stop will fail. So might be worth checking for any lingering connections, or maybe the replication group has non-VVol storage in it. I have heard some vendors have that interop issue. But I am just guessing at this point. Thanks Cody, turns out it was an user error by me. I had run the normal failover, not the testfailover. I cleaned it up by reversing the replication, because as far as I can see there is no other command to delete/clean up those mistakes? Ah okay. Easy to do–they are named so similarly 🙁 Yeah that would be the right option–will get things as they need to be and then you can manually cleanup what it created. Hello Cody, thank you for this very helpful post ! Just for information, I got errors with PowerCli11.0.0.10380590. It’s OK now with 11.2.0. You’re welcome! Ah yes I should have said 11.1.0 or later is required for the above. Updated it to that. Sorry bout that!